This marked the first week of my first summer college semester, wherein I’ll be taking two upper-level undergraduate courses condensed into five weeks. Busy, busy. So I’ve been stressed and a bit short on time to pick. I stopped by my first thrift store of the week on Wednesday to find a four Playstation titles. 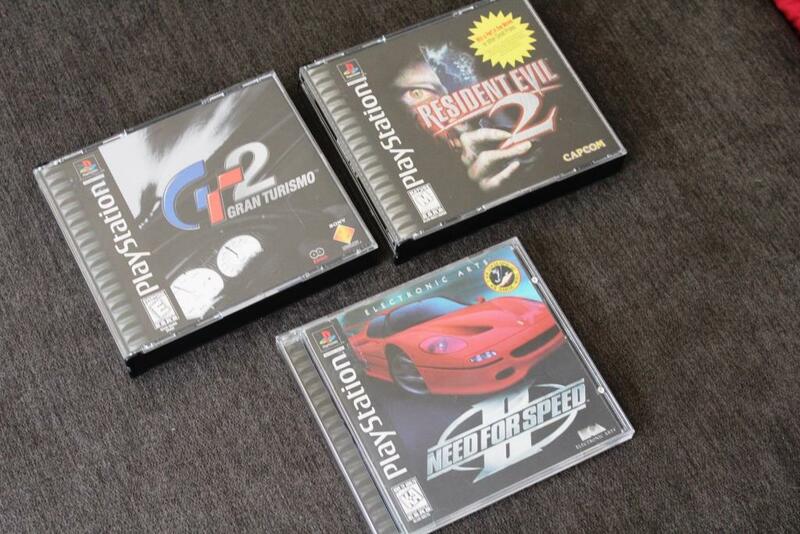 Gran Turismo, Gran Turismo 2, Need for Speed II and Resident Evil 2. I had purchased games from this store before to find that they don’t do a very good job of checking for scratches or completeness before putting these games on the shelves. So I checked each disc to find all of them in mint condition, with the exception of Gran Turismo, which had scratches and one missing disc. I grew up a hopeless Nintendo fanboy, and I still am for better or for worse. But my collector friends have been pushing me to collect more for Playstation, and I’m learning that I missed out on a lot of awesome titles growing up. Currently, Playstation (1,2,3 and PSP) are some of my favorite consoles to collect for. According to Price Charting, these games total about $27 in total at the time of purchase. Since I already have Gran Turismo 2 and Resident Evil 2, those will be added to my trade pile, and Need for Speed II will be added to my personal collection. At the checkout line with my Playstation games, I noticed this snapback at the corner of my eye– perfect condition with a unique faux red fur back. I hadn’t seen a snapback like it. 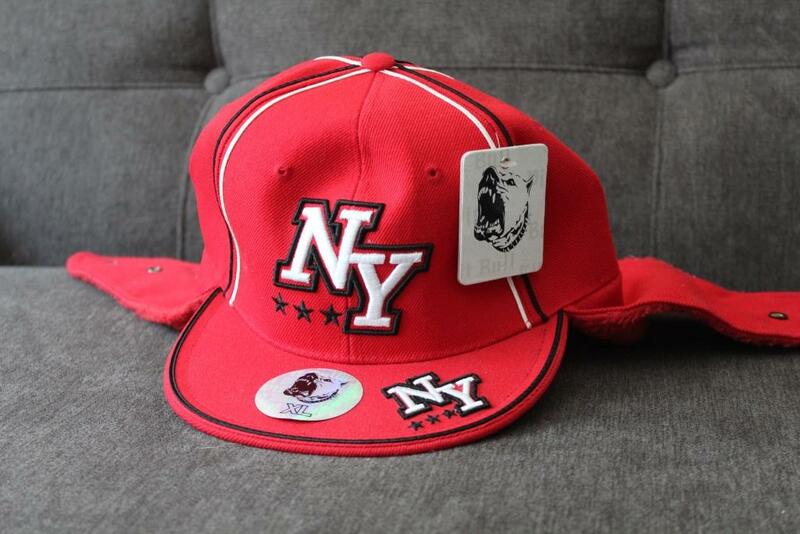 But it had a nice, but generic New York logo on it and it came with the tags and stickers. I took a chance at $5 and I’m going to try my luck on eBay. I’m at my beginning stages of selling snapbacks, so I’m still learning about what to look out for. But with so many other flippers, pickers and hustlers raving about the money they earn from snapbacks, I can’t ignore it. I’m hoping to get $20 out of this one. If you have any tips for flipping snapbacks, let me know in the comment section. Like I mentioned before, I’ve gotten into collecting PSP recently largely because a friend was trading off his PSP collection and made me an offer on the games I had for trade. So I’ll soon be getting about ten awesome PSP titles in the mail. When I found this game at my second thrift store of the day, I was excited. Firstly, because the cover looks awesome. I love the holographic feel and the Tim Burton-esque style. Secondly, I noticed the Konami logo at the bottom. From my experience, Konami consistently puts out quality games. And lastly, I saw the PSP game-sized box pictured to the left. The thrift store had it priced as another game. Upon further inspection, I saw that it was two special Death Jr. edition UMD cases and a digital Death Jr. comic book on a disc. I told that manager that it wasn’t a separate game but rather something that came bundled with the game, and I was able to scoop them both up for $3. According to Price Charting, Death Jr. is valued at about $8 at the time of purchase. 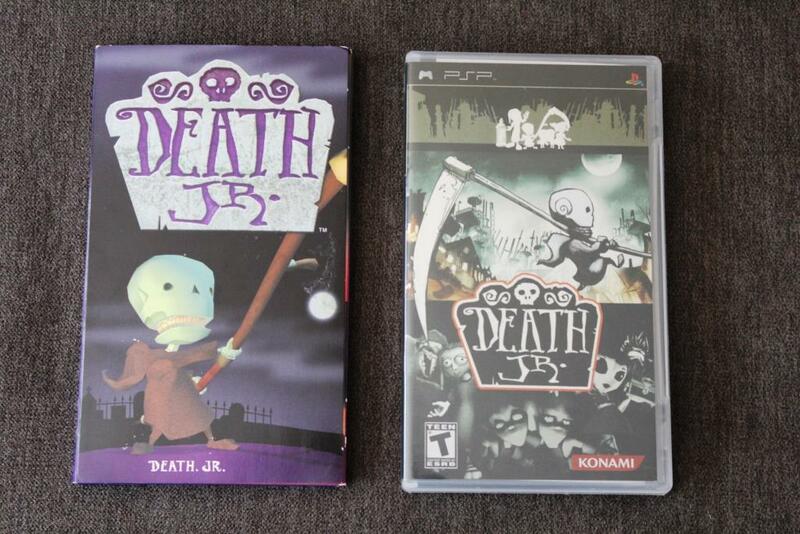 I also learned that Death Jr is its own video game series that span the PSP, Nintendo DS and Nintendo Wii. If I like this game, it’ll be great to explore some other titles in the franchise. Needless to say, this was the highlight of the week! Last week, I was able to locate three community yard sales within a ten-mile radius. So I was a little disappointed to find that there was only one community yard sale a twenty minute drive from my apartment. But as I was leaving my apartment, I looked down at my cell phone GPS. I usually spend about fifteen minutes the night before going picking and map out every yard sale that I plan on going to with a short, two or three-word description. This morning, I only had two locations mapped. One read “community yard sale” one read “Wii and PS2 games.” Both started at 7 a.m. and I had planned to go to the community yard sale first and hope a couple games were left when I got to the second yard sale. But for whatever reason, I decided at the last second to go to the one guaranteed to have games. Usually, listing that you have games at your yard sale means that 1) they’ll be gone by the time you get there or 2) they’ll be overpriced. I arrived at the yard sale at 6:40 a.m. to find that this wasn’t the case. My GPS didn’t lead me to the right address, so I wasn’t sure that this was the right yard sale. The first thing I noticed was a Rock Band drum set, but no games. So I asked the seller if she had any other video games for sale . She said that there might be a couple games for sale in one of the boxes. She pulled out a PSP case with one PSP console in perfect condition with three complete, unnoteworthy titles, two or three more loose games and a charger. I asked how much she wanted for it, she said $25. But I asked for $20 and she accepted. I asked if they had any other games for sale. She looked at me as if she had some but didn’t think I would be interested in them. She asked what kind of games I was looking for, and I said “literally any kind of games,” making a special point to note that I collect for almost every console. She said that she might have more games that her kids grew out of but that she’d have to take some time to look for them. Since the first set of games was so reasonably priced, I told her that I was willing to wait as she looked. She searched for about five minutes and came back out with a DS Lite and a bag with a Wii console in it. I told her I was interested in both, and she casually mentioned that she had Game Boy games as well that she’d have to look for. I made it clear that I would be interested in those too. But the other seller (I’m assuming it was her sister) snapped at her, saying she needed to focus on unloading the other yard sale stuff instead of spending so much time on me. So I not only told them both that I would be willing to wait for her to look (why move on to the next yard sale when this one could be a goldmine?) but that I would even help them move boxes to hurry the process along. With a really friendly attitude, I spent ten more minutes moving her heaviest items to wherever they wanted them. 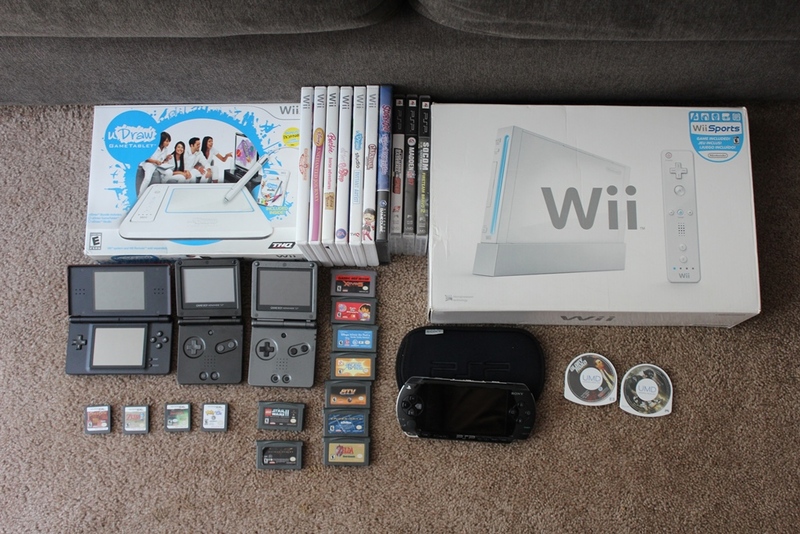 And when everything was out, the first seller went back inside for five more minutes and came back with more games– two Game Boy Advance SP consoles and a handful of common games. She said she had some trouble with the Wii console and didn’t want to sell it until she could test it. She said it was most likely the Wii Remote. I looked in the bag. The Wii console was dirty but in decent condition and the Wii Remote looked like it had been run over by a small car. But it had all the chords, I saw the box for the console out of the corner of my eye in the corner of the garage, and I felt like taking a chance. So I said that I would be interested in it and the ten Wii games that she hadn’t showed me yet. I was certain at least one of those games would be worth the trouble– no luck. But after over thirty minutes at this one yard sale, I had everything laid out in front of me and I was trying to think about what would be a fair offer. I was deliriously sleepy and was having trouble judging what the lot was worth. It was hard to make a decent calculation, because while the lot definitely had volume, only two games were worth anything (two Zelda games), most games were missing their cases and almost all of them were in terrible condition with the exception of the PSP, which was the only adult-owned console. But I wanted to seal the deal and move on. So I offered $90, she came back at me with $100, so we met in the middle at $95. I packed everything back in my trunk, happy but exhausted. According to Price Charting, this lot is worth over $400 at the time of the purchase. But the condition of these games likely lowers the value significantly. Of the entire lot, I decided to keep SOCOM US Navy Seals Fireteam Bravo 2 for the PSP, the complete in box Wii console (I had a complete in box red Wii, and I wanted the other three colors) and the PSP. The rest will be sold or traded to collector friends. The PSP was my very favorite pick of the week. Earlier this week, I traded some of my Game Boy Advance games and some DVDs for several PSP games to kickstart my PSP collection. But I didn’t have a PSP yet. So I started the week thinking about starting a PSP collection and ended it with a minty console and about a dozen games. I was at that first yard sale for forty minutes. And instead of going to the community yard sale thirty minutes away, I went home. I decided to stop at one yard sale on my way home, where I purchased one tiny but fascinating antique. I didn’t feel like it would fit into this post. So I’m going to write a post just for this item later tomorrow night. So stay tuned!